Our dear friends who have survived the Cleveland, Ohio weather for fifteen years encountered quite a surprise during their visit to Haleakala — they actually said they were COLD atop the mountain and weren’t prepared for how frigid the temperatures can be at such a high elevation. Their situation reminded me that, despite dozens of web pages devoted to explaining how cold Haleakala on Maui can be, the weather can still be quite surprising for many Hawaii visitors. So, here’s your Haleakala checklist — don’t summit the mountain without it! Layered, warm clothing (avoid cotton): It will be approximately 30 degrees cooler at the summit than at sea level and temperatures at the summit at sunrise will probably be around the 40 degree mark. Add the wind, and it makes for a very chilly morning, to say the least! So, you’ll need MULTIPLE layers of clothing, and try to avoid cotton. Your best bet is to pack “Cuddle Duds” or other thermal underwear for use under your long-sleeved shirt and pants. 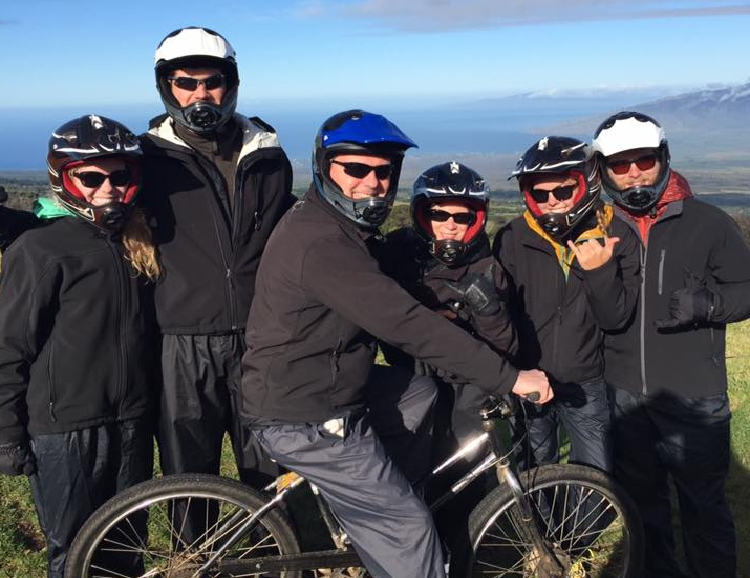 Watching the sunrise at Haleakala's summit and biking down is a popular, yet physically challenging and chilly experience. A thick coat: A windbreaker is NOT going to hack it here! Instead, opt for a North Face coat or ski coat, which is durable and warm. If you have a goose down coat, that would be ideal. You’ll need to anticipate rain, as well. So, best to have a hood or bring an umbrella. A warm hat WITH ear protection: Lots of visitors underestimate the wind atop Haleakala on Maui, especially if you’ve booked a bike ride down the mountain or a Haleakala Crater Hike. That’s why ear protection is so important — if your head is warm, and your ears are freezing, the experience can be quite painful. Gloves or mittens: Don’t neglect your hands! Because there’s so much to explore and see atop the mountain, it’s likely you’ll want the use of your hands. So, make sure you have good gloves or mittens (the insulated kind). Wool socks: You can actually use wool socks on your hands, too. But, for the sake of your feet, make sure you pack some hearty wool socks, which will keep your feet warm and dry. Scarf: For many visitors, packing a scarf may seem like the very last priority, but don’t you want your neck to be toasty? Enough said. Hiking boots: Even if you’re not planning to hike the crater, a pair of good hiking boots is a must-bring when heading to the summit. Besides all the debris left from other visitors, you might also find the terrain a bit uneven and hazardous, especially if you’re in flip-flops! Travel games: If you’re heading for the summit at sunrise, you’ll likely be waiting for up to an hour for the sun to rise. In that case, make sure you have some fun games for the kids to keep them occupied! 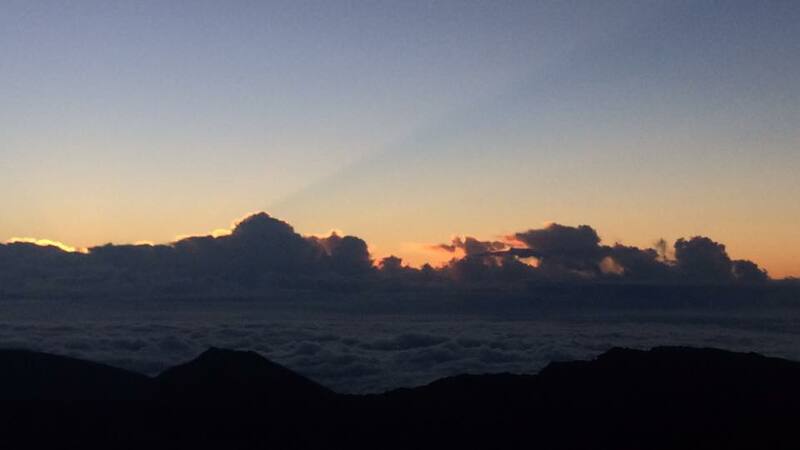 Visitors wishing to watch the sunrise from atop Haleakala often make the trek as early as 3am--the coldest time of the day on top the mountain. Cash: I always like to keep some cash on hand when making a trip like Haleakala because you’ll never know when you’ll need it. There’s an entrance fee to the park, and if you’d like to shop at the summit,, you’ll need some cash (although some may accept credit cards). A good camera: What a shame it would be to get to the big moment of sunrise and come back with so-so pictures. Even if you have to rent a good camera, it may be worth the cost, so you can return with the magical moments you wanted. A phone: These days, nearly everyone remembers to bring their cell phones everywhere, but if you forget, it could be a problem. If you have an emergency or car trouble, you’ll need to call for help. So, make sure you bring your cell phone with you! Sun protection: Don’t leave the summit with a sunburn! Food: No food is available at the summit, so you’ll need to bring your own. Water bottles: No water is available at the summit, either. And, you’ll need to stay hydrated. So, make sure you pack water bottles. You’ll also need a good attitude! Heading to the top of Haleakala on Maui is a big excursion, especially if you’ve risen at 2 a.m. to catch the sunrise!